SoftPlanet makes it possible for everyone to get free Free Driver Backup download directly from our servers. There is no registration needed for downloading. Free Driver Backup 9.4.5 is a free-to-download and use tool which belongs to the backup and system recovery category. It is an elegant and effective solution to many of you, who want to backup some or all of the computer drivers, cookies, registry and Internet Explorer Favorites. Later you can restore the backed up drivers with Windows Device Manager. Free Driver Backup works with Windows XP, Vista, 7 and 8. English is the only one language with which you can use the application. With its help you can backup your audio, video, mouse, network, motherboard drivers etc. Moreover, registry, cookies and Internet Explorer Favorites entries can safely be backed up too. 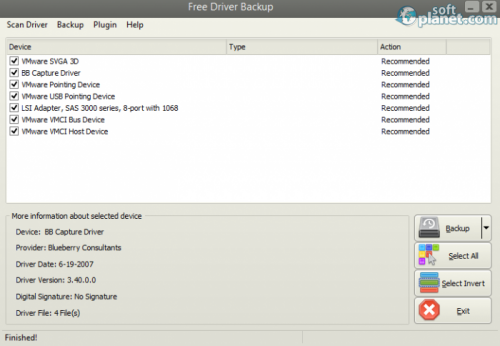 Free Driver Backup finishes the installation process with a short survey. Then you will face the program's main screen. The list with the recommended or all drivers for backup is shown in the middle. If you click on any of them you will see detailed information about that driver underneath. The four program menus are on top. The functional buttons are also four and reside in the lower right corner. Free Driver Backup scans for recommended or all installed drivers on your computer. This can be chosen from the first program menu. The backup destination folder can be set with the little black arrow next to the Backup button or from the Backup menu. All starts with the selection of the drivers which you want to save. Then just press the Backup button and the program will finish its work in a matter of seconds. The Plugin menu brings the drop-down list from which you can choose what else to backup. Free Driver Backup 9.4.5 can do your job 100 times faster. 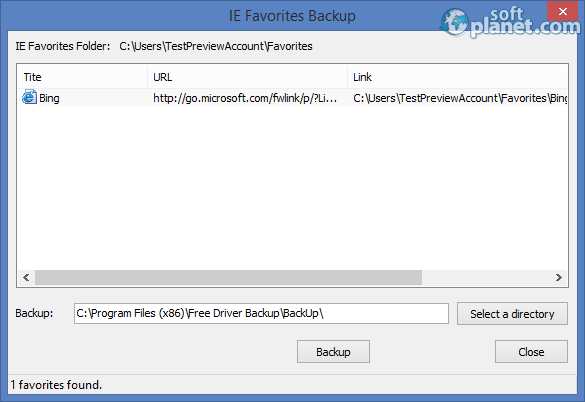 It will not miss or forget anyone of the recommended for backup drivers on your PC. We gave it a try and can assure you that it did everything we wanted with surgery precision. You can give it a try too and if you like it, refer it to your friends too. Free Driver Backup is VIRUS-FREE! Our security scan shows that Free Driver Backup is clean from viruses. The current version of Free Driver Backup has been scanned by our system, which contains 46 different anti-virus algorithms. That ensures that Free Driver Backup 9.4.5 is 100% safe for your computer.